Comment: “If we are to learn from Peter’s experience with the Holy Spirit, we should let go of our assumptions and live our lives aware that the Holy spirit comes breathing new life into us, pouring the Good News into our lives and communities in ways we cannot anticipate.” (Feasting on the Word, Year B, Volume 2, p 363) In her commentary on the text, Debra Carl Freeman goes on to ask questions that inspire readers to dream of how a world filled with the Good News would look. Similarly, we find inspiration from the children who wrote We Dream of a World… As we join together in worship to celebrate the Resurrection, we are called to think about the ways God inspires us to dream of a world transformed by grace. As we go out into the world, we are invited to live into that dream. Comment: Each year we hear the stories of Holy Week and Easter. Each year we experience Christ’s dying and rising. We, too can experience the anxiety and sadness expressed by Mary. The world as she knew it has been turned upside down. The life of her beloved teacher has ended, and while seeking to grieve, she finds his physical body gone as well. Mary’s experience is not so different from our own. We also worry about endings. 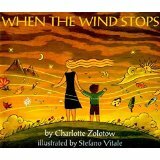 A little boy expresses these worries in When the Wind Stops. His mother eases his anxiety by explaining that all endings are new beginnings. Like Mary and the young boy, we can find comfort in the new beginnings and hope in the promise that life goes on and on. Lectionary Links: Easter Sunday, April 8, 2012 by Storypath is licensed under a Creative Commons Attribution-NonCommercial 4.0 International License.